I’m about to tell you a story of salty regret. A Magnum is basically a type of luxury ice cream sold in the supermarkets. It’s made with Belgian chocolate and all the works. Personally, I like Magnum ice creams – especially the dark chocolate one with almonds. 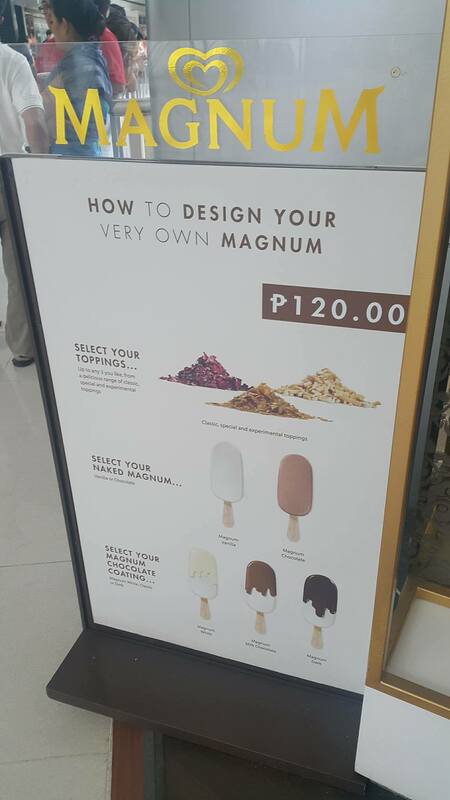 Anyways, Magnum opens up these little pop-up shops in different countries wherein you can make your own Magnum bars with your choice of toppings. When it opened here in the Philippines, people went crazy for it. I know the hype for Magnum Manila is pretty down already, but I never really got the opportunity to try it until recently. I was in the area when I decided “today is the day I’m going to try this thing”. I went up to the store in Mall of Asia and my eyebrows raised a bit when I saw the price (I mean, I could buy almost 3 regular Magnums with that price). I still decided to go for it since I knew it would be some kind of experience on way or another.